While the FDA pushes for a ban on kratom, a group of scientists is arguing that if it is labeled as a Schedule I drug, opioid-overdose deaths will only continue to increase. The United States Food and Drug Administration ramped up its “War on Kratom” this week by labeling the natural herb as an opioid, and a group of scientists is stepping up to vouch for kratom’s safety, and to argue that banning it would only lead to more opioid-related deaths. In response, a group of scientists came together to send a letter to the acting administrator of the Drug Enforcement Administration, Robert Patterson; and the counselor to the president who is overseeing the administration’s response to the opioid crisis, Kellyanne Conway. The letter strongly criticized the FDA’s recommendation to label kratom as a Schedule I drug, which would mean that the government will claim that it has no medicinal value. The scientists noted that when kratom is consumed in raw plant form, “it does not appear to produce the highly addictive euphoria or lethal respiratory depressing effects of classical opioids.” In fact, they argued that labeling kratom as a Schedule I drug would actually increase the number of opioid-related deaths in the United States. “It is our collective judgment that placing kratom into Schedule I will potentially increase the number of deaths of Americans caused by opioids because many people who have found kratom to be their lifeline away from strong opioids will be vulnerable to resumption of that opioid use, whether their prior opioid use was for relief of pain or due to opioid addiction,” the scientists wrote. The letter cited several national surveys and a wealth of studies from both the U.S. and Asia, which found that “kratom has been used as a safer alternative to opioids for more than a century,” and if the government truly cared about the safety of the consumer, they would refrain from making kratom a Schedule I drug. 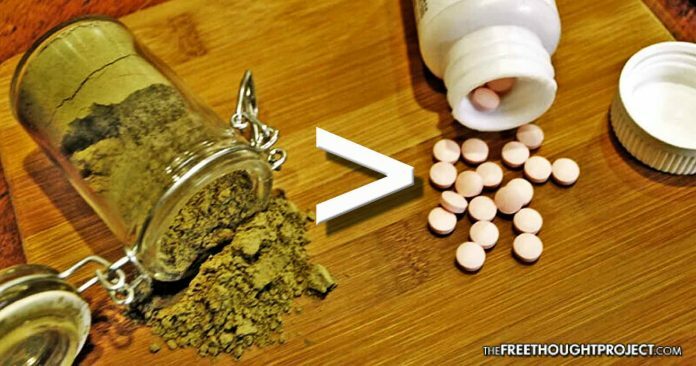 Why is the FDA pushing to ban kratom when research has shown that not only is it a safer alternative to opioids, but that it actually helps to prevent opioid-overdose deaths? Before taking over the FDA and using his position to enrich his fellow legal drug dealers, Gottlieb was a member of GlaxoSmithKline’s product investment board. And, as TFTP has previously reported GlaxoSmithKline owns a patent on a kratom alkaloid designed for the very purpose of treating pain, thereby alleviating dependency on opioids. One of Kratom’s alkaloids—Speciofoline—was researched decades ago by Gottlieb’s former employer and its effects have been widely studied and reported on. It just so happens that a patent was filed for Speciofoline on August 10, 1964. The patent claims the “alkaloid has useful pharmacodynamic activity, particularly analgetic and antitussive activity.” But that’s not all. Other studies—which the FDA says do not exist—have been conducted for the specific task of treating opioid dependency.